Not only does March signify that spring is coming, but March 2nd, Theodore Geisel's birthday, kicks off Read Across America Day and Literacy Week. 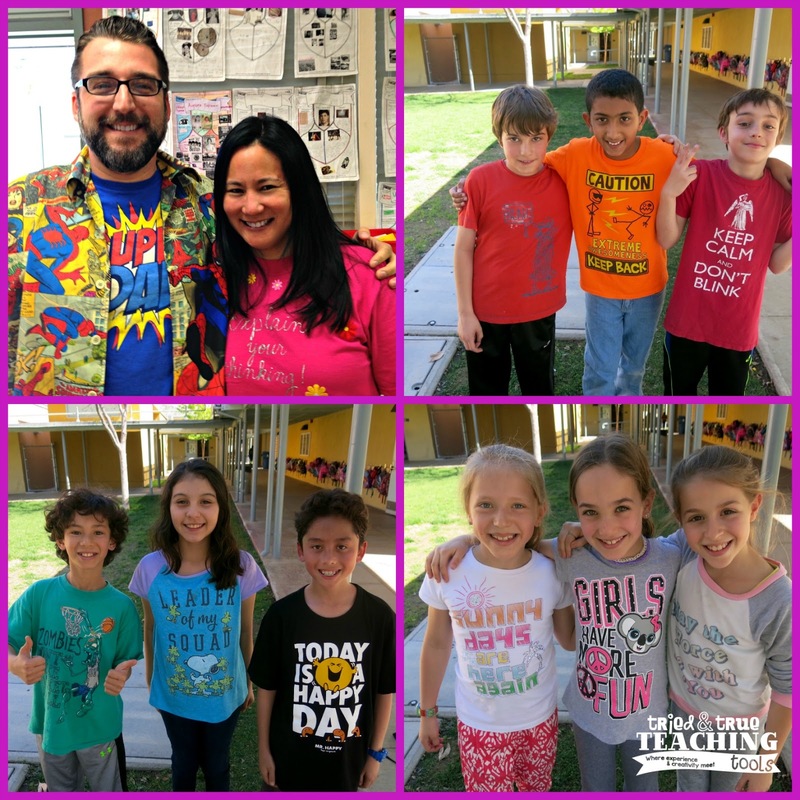 This is my favorite week of the school year! Monday: Read my Shirt Day! 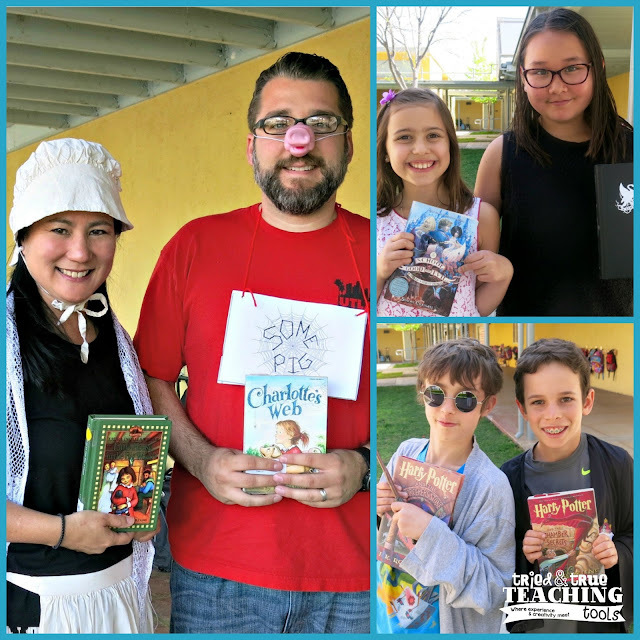 Students came to school dressed as a character from a favorite book. They gave clues to the class about their character, as we all guess. We realized that since many fourth graders read a lot of realistic fiction, their characters don't dress much differently than themselves. Their clues became really important when guessing their character! We were so lucky to have one of our favorite authors, Marc Clark, back for a visit. He is the author of The Princess Fables and The Royal Fables. Check out his website for a free Princess fable download. His stories are always filled with action, adventure, and very untypical royal children! My students beg to keep reading his books! Marc was in Los Angeles for the first leg of his 6 week book tour to launch his first hardback book, The Parakeet and the Princess, and to kick off the GoFundMe Campaign, titled: “A Fairytale For Our Fairy Princess”: https://www.gofundme.com/r5a2a. More on this in a separate post later this week! Marc loves to interact with children so my class was very excited to learn about a writing technique called "in medias res", (in the middle). Rather than begin a story from the beginning of exposition, authors use in medias res to open in the middle of action, then uses flashbacks, dialogue, or description of past events to fill in the reader. After reading the beginning of one of his fables, students tried the technique with the classic fairy tale, Cinderella. All students were so engrossed in their writing & were pleased with how their writing became much more interesting! Another special event that day was Lunch with the Author. 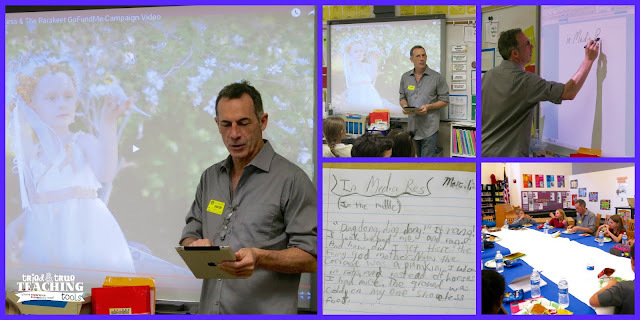 Upper grade students wrote about why they wanted lunch with an author & a couple of students from each class joined Marc for lunch. I loved listening in on their questions and writers' conversations! Parents volunteered to read a picture book to our class throughout Literacy Week. The parents shared some books (new books for me that I have not read before!) and the children were thrilled to see their moms sharing a favorite family book. 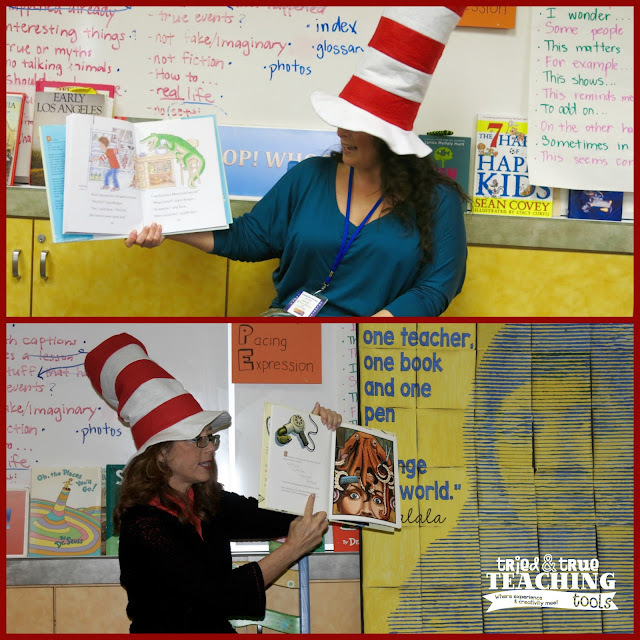 And of course they were all good sports to wear a Cat in the Hat hat while reading! Happy birthday, Dr. Seuss! Each student in our school filled out a mini-book cover with book title, author, and illustration, then taped it to two huge Happy Birthday Day, Dr. Seuss banners. 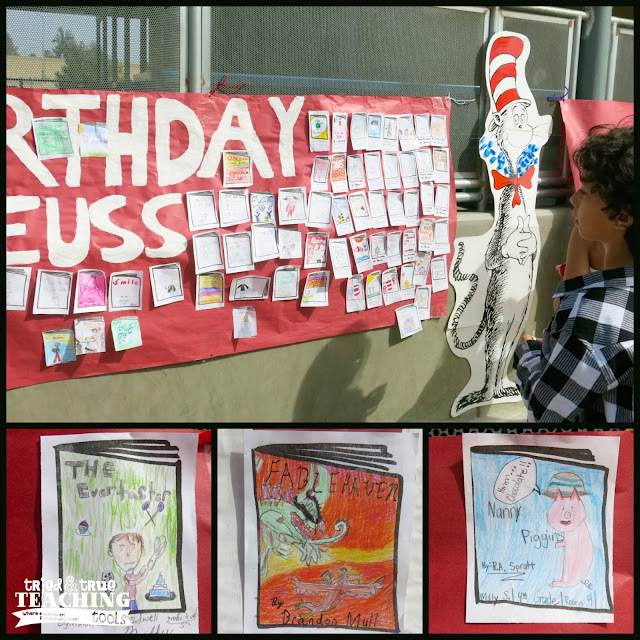 The kids loved looking at all the books represented and getting excited when they recognized favorite titles. All students and staff carried a poem in their pocket, then pulled it out to read to each other on the yard, and while walking around the school. They loved hearing each other's poems! 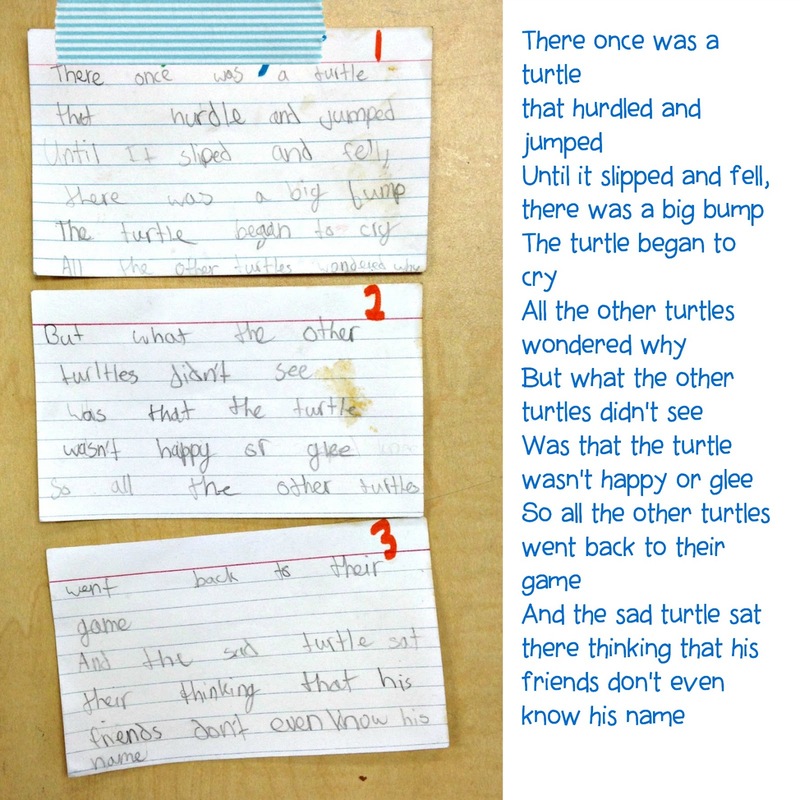 I was so impressed that quite a few of my students took the time to write their own poems. At the end of the day, we hung our poems on a tree outside our classroom, turning it into a "poet-tree"! 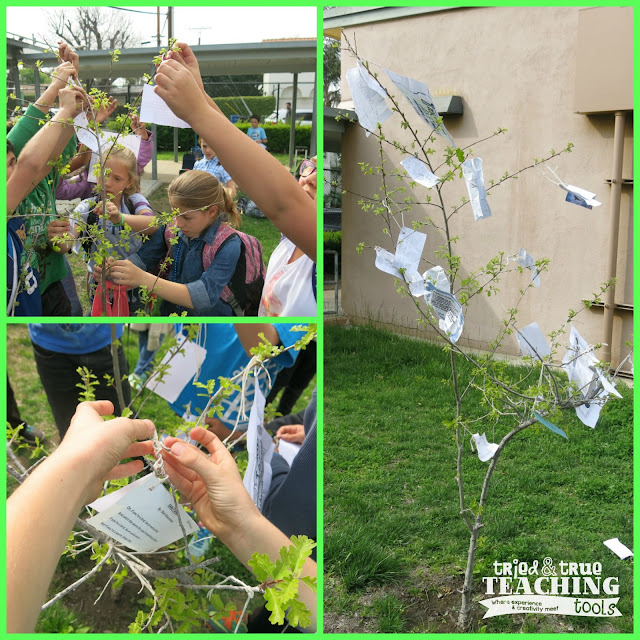 Even the next day, kids came to school and ran over to the tree to read poems! Two guest authors in one week? Our students were so happy; they assume all my friends are authors! But what I love the most is our students feel they, themselves, are authors and want to ask questions and talk about the craft of writing with these adult published authors! R.A. Spratt came all the way from Australia to end our Literacy Week with a bang! She is the dynamic, talented, and hilarious creator behind the Nanny Piggins series, as well as her new (to America) mystery series, Friday Barnes. She entertained our kids by blowing a bugle (really loud!) 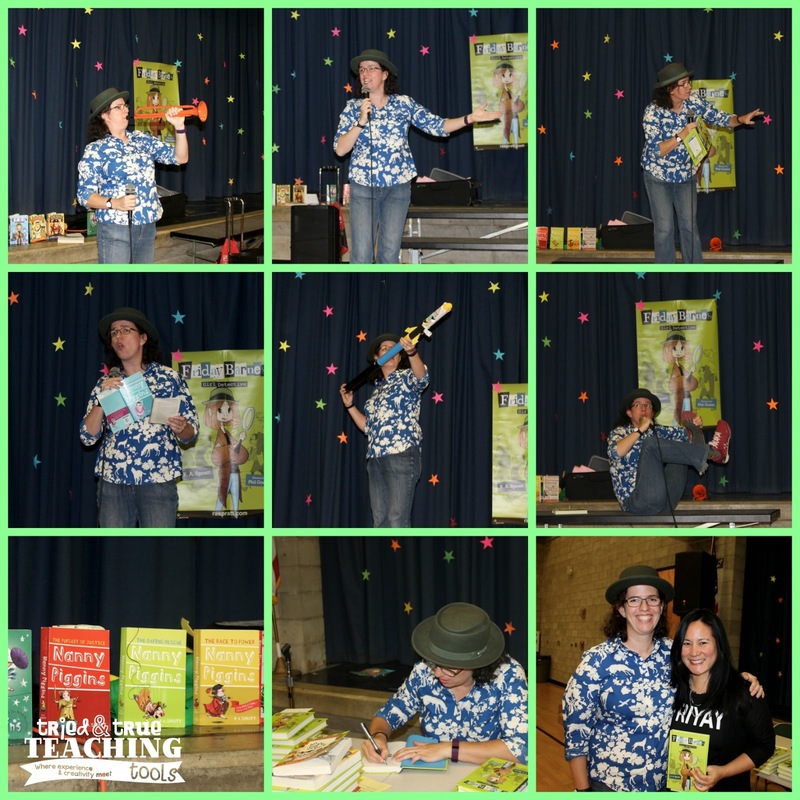 to get our attention, reading (or ad-libbing) from her books, telling stories of how she gets ideas for writing, and even "shooting" nerf blaster darts at teachers (!) to tell students to think BIG & outside the box. She signed books and after her presentation, there were kids all over the school reading while they walked back to class! My own daughter finished her book by Saturday & is quite upset that the next book in the series is not available in the US until August! Needless to say, I'm exhausted after our incredible week! 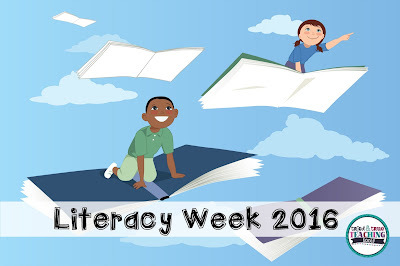 How does your school celebrate Read Across America Day or Literacy Week? Please share your ideas!